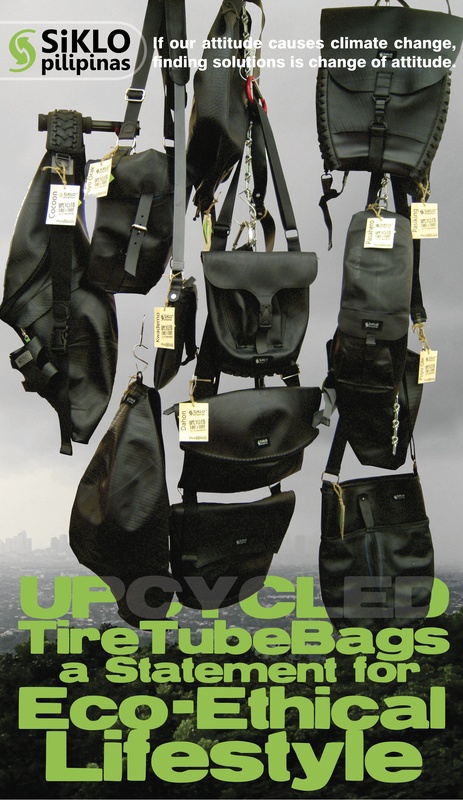 Siklo Pilipinas - Pioneer and the only registered enterprise in the Philippines upcycling discarded innertubes and bicycle tires into bags and accessories for eco-ethical lifestyle. All designs are originals of the brand. Backpacking around for more than a decade, avid back packer couple and artist-designer Lyndon Ecuacion and Clarice de Villa found alternative solutions in inner tube and tire rubber as a suitable material to protect gears in the adventure travel lifestyle. It is sustainable so long as humanity use wheels. Since there is no known disintegration rates for tire rubber to decay, upcycling this material implies durability that can outlive our generation. It then evolved and blossomed into an advocacy geared towards socio-economic solutions while inspiring green initiative for our only planet and its entire inhabitant. Hence, Siklo Pilipinas was founded. First venturing into several alternative uses for discarded inner tubes and tires, from home furniture and decos, to footwear, the couple paid more attention on bags and fashion accessories. On one hand, it uses more rubber materials (which is ideal for the cause) and artistically more dynamic. On the other hand, these materials can speak more at a glance of the company's statement for eco-responsible lifestyle into a wider audience. Working around the innate characteristic of tire rubber Siklo Pilipinas products take organic forms and shapes unique only to these materials and became trademark of the brand. Siklo Pilipinas is the only brand and pioneering in the manufacture of this type ofupcycled products in the Philippines.